AACN’s Summer Seminar is Coming to Canada in 2018! - Canadian Association of Schools of Nursing / Association canadienne des écoles de sciences infirmières (CASN / ACESI). AACN’s Summer Seminar is Coming to Canada in 2018! Home » AACN’s Summer Seminar is Coming to Canada in 2018! Each year, deans, directors, and senior faculty from American Association of Colleges of Nursing (AACN) meet annually in a picturesque setting far away from the pressures of daily administration to sharpen their leadership skills. This year’s destination is Québec City! 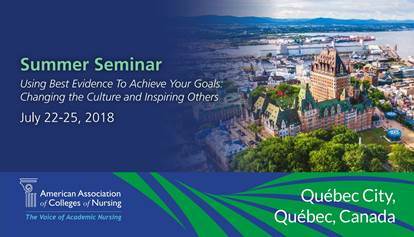 We invite you and your team to join us July 22-25, 2018 at Fairmont Le Château Frontenac for a journey on how to change the academic culture at your nursing school while inspiring others, and achieving optimum fulfillment in your career. By attending this 3-day program led by Positive Psychologist Caroline Adams Miller, you will identify mechanisms to create a culture of flourishing within your school, explore the true meaning of “grit,” cultivate a mindset of self-efficacy, resilience, and optimism, and apply current research on grit and goal setting to challenges facing academic nursing. Learn more and register here.